Doing a lot of family stuff the last couple of days. Yesterday, we met Malcolm’s brother David for lunch. He teaches at a college and they were off for Good Friday. We had a nice lunch at Steak & Shake, then headed over to the grocery store. We picked up hamburgers and hot dogs to grill out and David bought dessert and sent it back with us. We stopped by an RV store nearby and filled one of our propane tanks ($23 – a good price for a 30 lb. tank). We then took the tank and groceries home and put everything away. We started cooking around 5:30 and the family showed up around 6:30, just as Malcolm was taking the hamburgers and hot dogs off the grill. It had threatened rain but never did more than just spit a few drops. We ate dinner and chatted for a couple hours. Today, we got up and were just kinda lazy around the trailer. We went ahead and washed breakfast and lunch dishes but didn’t do much else. Around 1:00 we left to go put fuel in the truck then swung by Malcolm’s brother’s house and picked up his family. We drove 2 hours north to Williamstown, Kentucky to visit a bunch of our cousins and their families as well as our aunt and uncle. It was a great visit. Our aunt and uncle are getting really frail – they are both 87 – and our aunt has Alzheimers and really couldn’t remember any of us. We hadn’t seen them for about 10 years, so it was sad to see the decline. But they have lived a full life. It was also great seeing the cousins as we hadn’t seen some of them for quite some time. 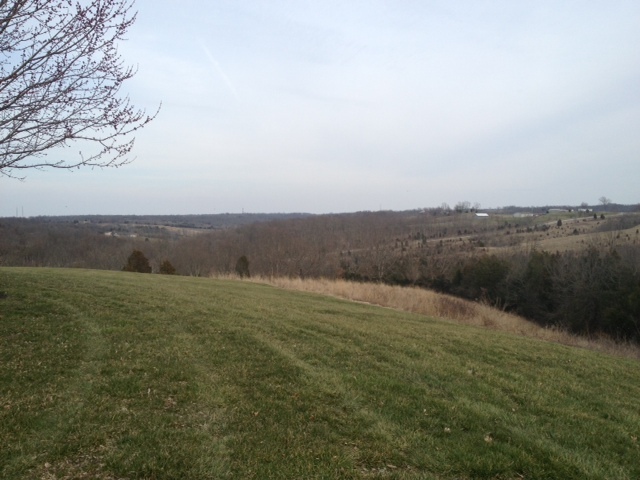 The view from our cousin’s house was spectacular – you could see the rolling hills of northern Kentucky really well. Tomorrow, we’re off to church with Malcolm’s brother and his family for Easter service. Not sure what the rest of the afternoon’s plans are. We roll out Monday towards Lexington. This entry was posted in Kentucky, traveling. Bookmark the permalink.